The chicks are certainly acting adventurous and bold. All four are out on the ledge waddling around even though they are hardly capable of flight! Many concerned viewers have lamented how nervous this makes them. I couldn’t agree more. I have many more grey hairs worrying about these little stinkers! We are prepared if a chick tumbles from the parapet ledge into the window well. The window well is 5.5 feet deep and we have had a chick stuck there in previous years since they can’t fly straight up and their parents can’t reach them either. A couple years ago, we built a ramp that leads from the floor of the window well to the ledge near the nest box. A chick can now be empowered to walk their way up the ramp to get back to the ledge, since walking and exploring are big past times at this age. We try not to think of the possibility of a tumble off the building and can only hope they glide well to a safe landing. 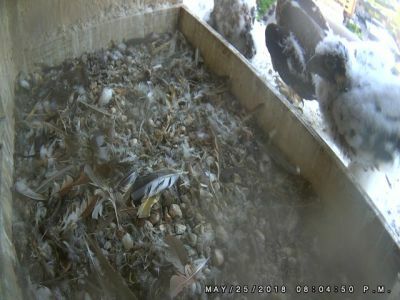 Peregrine chicks are supposed to fledge (take their first flight) at 40 to 45 days of age. Day 40 for the oldest chicks would be June 3. I will take bets we do not make it to June 3 before a chick takes the leap. There has been one chick that fledged on Day 35 each of the last two years. They have successfully glided to the ground and were picked up by the Peregrine Patrol and brought to rehab to give them time for flight feathers to fully emerge and get a bit of practice in a flight cage. If you are in Kalamazoo and are interested in helping the Peregrine Patrol out, please send a message through the contact us button. It is important to keep tabs on these youngsters as they get ready to fly so we can make a fast rescue if they become grounded. Watching for even a couple of hours is helpful during those critical days.